Looking back approximately 30 years on the beginning of a work enables perspectives which were not readily apparent to us then. Brother Murray Pratt and I, along with our families, had been living in the Kapuskasing area in northern Ontario, where a new work was in progress and an assembly established in March, 1981. The following year, some believers from the Timmins area, approximately two hours away, invited us to try some meetings there. In 1984 we were invited back again, and held tent meetings. A few professed to be saved at that time, and we continued with a weekly gospel meeting in a school over the winter. In the spring of 1985, Murray and Doris moved to Timmins, and we often held summer tent series and regular ministry and gospel meetings in their home over the next three years. Becky and I also moved in 1986, leaving the fledgling work in Kapuskasing in the responsibility of local men whom God had raised up to shepherd the flock. 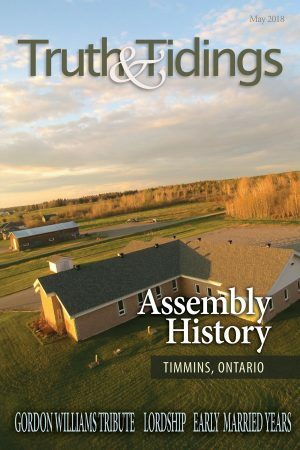 However, we, along with some of the believers from Timmins, traveled back to Kapuskasing to break bread until the assembly was finally formed in 1990. When a new work does not progress quickly or smoothly, it becomes discouraging, not only for the evangelists, but also for those who have joined the group. By the spring of 1988, about half of the group had left. After consultation together and seeking the Lord’s guidance, we had another effort in the gospel, and there was just enough encouragement to keep us going. In January of 1990, with felt weakness, the decision was made to begin as an assembly. Almost simultaneously, another Christian couple informed us they hoped to move to the area, which was for us an encouraging confirmation of the Lord’s good will. In April, the assembly began to function with about 12 believers in fellowship. We were able to use the library of a local public school, as one of the believers was a teacher there. Believers were gradually added over the next two years, giving a sense of stability in the work. However, in a four-month span in the fall of 1992 into the spring of 1993, the assembly went through the shock and sorrow of losing two beloved sisters in their thirties: Murray’s wife Doris through cancer, and another sister in a tragic car accident. It was devastating for both the families involved, and for the assembly. Others had to move away for school and work, and once again, the work was almost cut in half! Ironically, the following year saw the most significant season of growth, with blessing in salvation in a gospel series held in January, along with an influx of primarily young believers from another evangelical group. In the Lord’s tender mercy, He also granted our two grieving brothers suitable life partners with whom they have continued to serve God faithfully. I have come to believe there are life experiences that are not to be explained, but endured, and we honor the Lord deeply by our continued trust when our loss is the greatest. We began to make plans for our own building to meet in, and a suitable property was purchased in the fall of 1994. In the summer of 1995, we started construction, and with much willing-hearted labor from many believers both locally and from other areas, we were able to move in by the end of November. While there have been seasons of discouragement and loss since then, the assembly continues on in the grace and faithfulness of God. In 2007, Murray and Martha moved to the Beachburg area in eastern Ontario, where they continue to serve the Lord. Becky and I moved to Sudbury Ontario in 2008. We have noted over the years that there are times of visitation which the Lord graciously grants in various regions, and among particular groups of people. During those same fruitful years in Kapuskasing, there were other areas in northern Ontario, including Timmins, where God seemed to be reaching people of French Roman Catholic background. A number of evangelical groups saw significant growth at that time. Similar blessing occurred in New Brunswick as well. It may be that God responds to people who, whether individually or as a group, have retained a measure of the fear of God and the revelation of Himself that they have been given. In more recent years, this has also been observed in various regions among people of Hispanic, Mennonite, and Hutterite backgrounds. God’s sovereign mercy should bring us to awe and worship. “Who has known the mind of the Lord, or who has been His counsellor … For of Him, and through Him, and to Him are all things: to Whom be glory forever. Amen” (Rom 11:34-36, KJV).